My three year Blogiversary was in August. I always seem to miss it! I actually was aware of it this year but too busy at the time to host a giveaway. I can’t believe I’ve been blogging for three years. Blogging would be no fun without all of you so I want to thank you for following me and all your fantastic and encouraging comments. I thought I better hurry up and run a giveaway because because I’m pretty sure the Sew Mama Sew Giveaway Day is coming up in December and I’ll want to be a part of that too. So here’s what I have up for grabs. I have four Cotton + Steel basics fat quarters, a spool of purple Aurifil thread 28 weight (I like this for machine quilting – especially on mini quilts), a spool of peppermint Divine Twine (great for wrapping Christmas gifts!) and the book “Fresh Vintage Sewing” by Joanna Figueroa (love her!). To enter please use the Rafflecopter below (if you don’t have Facebook you can sign in with your email). And thanks again for being here. Really. I appreciate all of you. The giveaway will be open for a week and the Rafflecopter will pick a winner for me. I'm making some pj's, pillowcases, a t-shirt quilt for my niece and a cat themed quilt for my sister. I'm about half way there. I'm working on some tote bags and pillows for World of Charity Stitching. I'm quilting my youngest daughter's quilt, pillow covers, and a quilt for birthdays. Happy Blogaversary! Thanks for the great giveaway. I am finishing up a dress that I made for a friends, then I have at least one more dress to make for me this time. I have a small quilt to make, for the new Grandson! Fabric Pumpkins of all kinds and some Christmas stockings a table runner or two whew!!! I'm hand quilting a black and white plus baby quilt and I'm hoping to get a tree skirt made too. Finishing up swaps and Christmas gifts,,,,,I hope!! I'm putting the binding on a quilt that my 3 sisters & I made together – a kind of round robin quilt. And I have some Christmas throws that need to be finished for gifts. Happy belated blogiversary & thanks for the chance to win. I have one quilt binding to finish of the 3 I am making, then the pillowcases for the wrapping. They will be in the mail by Monday and I can make the gifts for my quilt buddies. I need to make a lap quilt as a birthday present for a very good friend and a Christmas stocking among other things. Thanks for a great giveaway. i'm working on some kids clothes, and two pillows. I'm making my dad a kindle case/cover/stand/thing. I promised it to him a few months ago when he bought his kindle. I started it a couple of days ago, but didn't get much done, and want to get it finished by the 14th for purse palooza at sew sweetness . After that, I think I'll try to finish a wall hanging for my bedroom. I finally made Christmas Stockings for my family…. Even made one for our pooch!! Now I am thinking about making other Christmas gifts. Thanks for the chance to win your celebration prize, great choices!! Happy anniversary! I always miss mine too! I'm working on my Michael Miller cotton couture challenge. A quilt for my stepmother. Happy late anniversary! I'm sewing some pants for my boys. And warping my loom! I need to get started on about 6 quilts for Christmas! I am working on several Christmas gifts. Love the season! My sewing plans for this weekend are a dress for my 4 year old daughter for school pictures on Monday, a drawstring laundry bag and a makeup tote! Finishing up a couple projects, wall hangings. I'm making aprons for my sisters! I'm working on several lap quilts and maybe some pouches! I'm behind in everything at the moment. Happy Blogiversary! Thanks so much for the giveaway! I'm working on soup cozys as Christmas gifts. 4 pairs of PJs and quilted journal covers. Congrats on 3 yrs. my how fun time flies . Aprons for my God daughters and me out of Cotton and Steele. thank you very much. I really need to clean my house–it's been too nice outside! 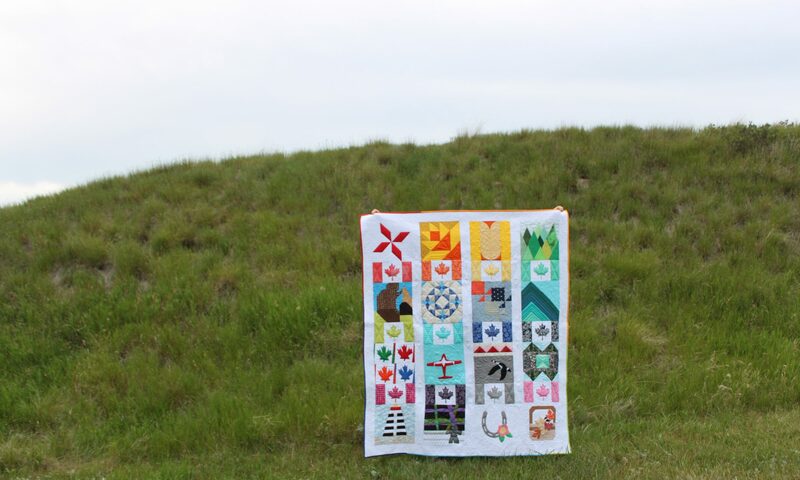 I have a birthday quilt that needs to get moved to the top of the list and lots of christmas projects: an applique wall hanging, a minecraft hoe pillow. I better get busy. Happy Blogiverary! i'm working on knit garments in the next few weeks–t-shirts, pants & skirts! I'm hoping to get an Advent calendar made up for my grandson as well. Happy Blogiversary from Ontario. I'm working on a fall table runner of blacks and oranges with appliqued pumpkins. I need to quilt a quilt for my mom then bind it and finish my son's quilt. I also want to make a holiday dress for myself with a Gertie Hirsch retro pattern. Congrats on your three years blogging! Napkins, potholders and tea towels for myself. I just finished a open wide zippered pouch for my guild swap. I have red and white fabric cut and on the design board for a (hopefully) xmas tote present. I'm going to be making a new robe for myself. Have the pattern and fabric picked out and ready to start. Curtains for the art area in my classroom. Happy blogiversary!! I'm planning on sewing my Christmas gifts. I've been planning on doing that this past week, but life keeps getting in the way. So fingers crossed I can actually get to them this coming week! Happy Blogiversary! I am working on Christmas gifts: quilt, throws, mug rugs and a table runner. Happy Anniversary! I am finishing up two flannel rag quilts for Christmas gifts. Thanks! I'm working on an X Plus Quilt that I have no idea how it's going to turn out… it's very exciting. I try to make as many gifts as I can for birthdays and Christmas – I also make and donate childrens and baby quilts for my local Womens shelter. I have just finished my favourite thing to do and that is make personalised Christmas tree ornaments. Thank you so much for your generosity Anita. The fabulous giveaway will find a good home in Australia. With summer upon us the fabrics are inspirational and I can't wait to show off the book to some traditional sewers.